I don’t have matches for Lucha Underground this week as of yet; it’s harder to guess without that tournament happening. The preview mentions Dario talks to Matanza about Rey and the Havoc/Madness and Ryan/Cortez feuds continue. This is episode 33 and Ultima Lucha starts with 37, so figure on a lot of building up feuds for the next four weeks. We’re probably due some more medallions be handed out in addition to the Rabbit Tribe. AAA has either an super rare live show, or an extremely pointless taped show that’ll finish airing about 30 minutes before the PPV starts. All matches aired live from Arena Puebla. Arkángel de la Muerte, Espanto Jr., Rey Apocalipsis beat Arkalis, Astral, Tigre Rojo Jr.
Marco kept the heavyweight title in the main event. Juice Robinson offered a tag to Volador and pulled it back early, which seemed to convince Volador not to bother helping at all. He stood on the outside while his partners got beat and eventually turned on them after Rush fouled Taven. The main event hit the highlights effectively, showed better chemistry than expected for two guys who aren’t opponents all that much. Not everything looked perfect but enough of it did to surpass my small expectations. The brief length really stood out, and there’s no mistaking this for an epic title match, but I’m left thinking I’m happy with them getting out fast than pushing into areas they wouldn’t do as well. Diamante Azul worked slightly more rudo, but it wasn’t strong either way even with the Mexico/Foreigner story all over these shows. The semimain was smoother the foreigners/Mexicans match on Friday. Progress is a good sign, but they also seemed to be less here, with the match really just a setup for Volador deciding not to get along with this partners. You can skip it. The third match was usual good people having just a routine average match. The Revolucinarios didn’t seem into it, and there was no one singular performance by the tecnicos to make it worthwhile. I breezed thru the opener but it still stuck out as better than usual. They seemed to have more freedom to do stuff in the open; not dives, but the double slingshot armdrag spot might as well be a dive. Astro& Asturiano are signs of good matches, and I think Perverso is getting better. They had less time but worked a faster pace, and so the match felt like it ended at the right time. Gym FILL (Black Terry) vs Gym Cuautitlan (Robin Maravilla). Black Dragon beat Xcorpio for the win. Gym FILL gets a win after losing a couple of these to Indy Nation. I wonder if a year long league of these school versus school matches would generate some interest; 6-8 schools, maybe everyone gets home and home and a big winner at the end. It requires way too much organization for indie lucha libre to ever actually happen. Very close to calling this Aero Boy “Fake Aero Boy” just to make my life more amusing. Kevin Gill and Gabriel Ramirez will be the English language announcers for TripleMania. Ramirez runs Pro Wrestling Revolucion in California. Gill calls those shows, other wrestling promotions, and also is part of Konnan’s podcast. I’d expect they’ll be professional announcers, a step up already, but I have no idea about their product knowledge. TripleMania’s big matches aren’t hard to get up to speed, but it’s a deceptively tough show to call – the Torneo Triplemania will have roughly a million people involved, and even I’m not claiming to know all the people in the La Llave a La Gloria matches. The ladder match has 3 people involved, but about 8 different angles and a bunch of people who could run in for different reasons. Prepping foreign language announcers is not a big priority for any wrestling promotion, so I hope they’ve done their homework. The Twitch event page for TripleMania in English has a couple of unexplained details about the lineup. The La Llave a La Gloria competition will be two matches. (With 14 people, maybe that’s an atomicos and a trios.) Pagano vs Mesias is listed as an Ultimate Consequences match, whatever that means. The main event seems to have a little more consequence. Even that lineup doesn’t know who’s going to be the GFW team. Ok, now that you’ve scrolled past the list, know that’s probably not the full list. 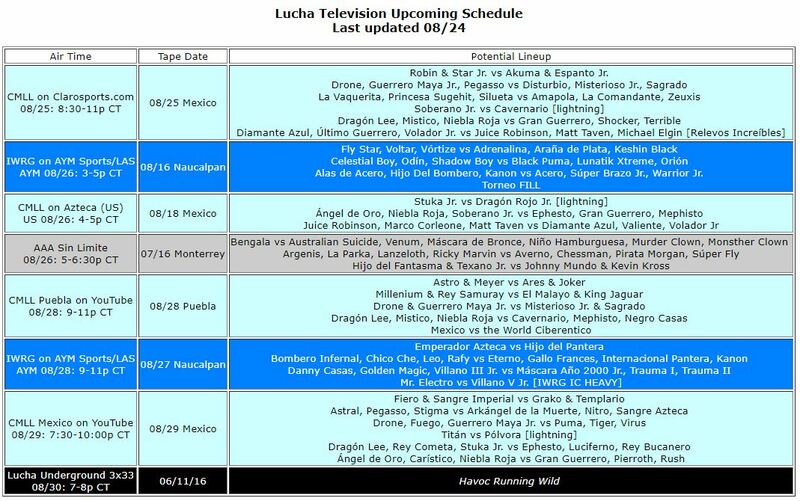 AAA says it’ll actually be a top 20 TripleMania matches of all time marathon, which means a lot more matches will be airing and probably none of them in full. There are some weird picks up there, but if they’re breezing them in about 90 second each, it doesn’t matter as much that you’re showing a match where La Parka got clowned. The preview makes it sound like the English announcers will be calling these matches too, which hopefully will be taped in advance if true or they’ll have a gigantically long day. AAA announced Aida Cuevas will sing the national anthem at TripleMania. She’s a famous Mexican singer who also has a new album coming out a couple days after the show. Lucha Underground is now available on DVD and BluRay – in Germany, only. Lucha Underground’s Facebook current says Ultima Lucha starts on Wednesday, September 23rd. There is no Wednesday, September 23rd. They mean the 27th. El Rey announced some new programming which starts Septmber 5th, but there’s still no word on Lucha Underground’s future. Vampiro, King Cuerno and Drago were added to the October Tokyo AAA/LU shows. AAA still has not acknowledged these shows as happening. Puma, Misterioso, Soberano and Fuego had a match in a tiny ring at a bartending contest. The match starts about 24:00 in. Low Ki is still being advertised as coming in for the 09/02 The Crash show, which may not turn out to happen. He seemed to be coming in thru GFW, only he’s not in GFW any more after the latest set of tapings. The REINA International Junior championship – the one Keyra had – will now be decided in Japan in a match on 09/15 between La Jarochita and Kaho Kobayashi. Real Aero Boy talks about how got into lucha libre. CultIcon continues his best of TripleMania countdown. Segunda Caida has a quick review of Terrible Cererbos vs Ninja Turtles. The new edition of AAA Zona Ruda has the Perros del Mal as guests. Argenis, La Parka, Psycho Clown beat Averno, Chessman, Dr. Wagner Jr.
There’s frequent promos for Wagner/Psycho airing on Televisa. Dr. Wagner was unbothered by the loss, and unmasked Psycho Clown for the umpteenth time. He got off pretty easily, maybe it’s all the practice. The Kross/Bronce segment starts with Pimpinela being brought to be praised for her 30 year career and her win over Mamba. Pimpinela barely getting to talk before Kevin Kross attacks her. I have no idea why. Mascara de Bronce runs out face Kevin Kross, and of course gets knocked down to start the match. Pimpinela rolls out of the ring and ceases to exist. Kross only takes offense from Bronce when he’s not paying attention, and eventually just no sells a tope. He kicks the (new) ref after the match too. Divina & Mamba were friends last time we saw them, but are enemies here. Marty was a rudo when we’ve see him. Elegido gets the only noticeable crowd response. Not sure what causes Bengala to bleed early, but he spends the match with it coming of it his mask, and Suicide rubs it all over himself during the early beatdown. This matches ten minutes and then, after trying hard to win the match, Marty attacks Elegido from behind for no particular reason and the match ends about 15 seconds later. Noti AAA had Vampiro raving about La Llave a La Gloria and all the positive feedback of his changes, and Psycho Clown meeting with players on Club America. This was a rather nothing happening show to be the last show many people will see prior to TripleMania. They did the token Wagner/Psycho feuding in the main event but that didn’t even come off as a big deal. The other matches had nothing to do with anything going on Saturday. This is a great test case for nothing really mattering, because they did nothing here. The main event was an ordinary trios match, with La Parka seemingly getting as much time as Psycho Clown, though they did get around to Psycho/Wagner at the end. It didn’t feel as big as it should, but I supposed it doesn’t really matter at this point. Averno & Chessman stooged well for Parka – it’s like working with a less mobile Super Porky, Averno has this down. Psycho’s looked good and was pretty over, there just wasn’t the anticipation moments when he and Wagner were in you’d expect for a big match. Argenis was also there. Kross/Bronce was not really a match in the usual sense. Kross just squashed Mascara de Bronce in a way where Bronce is pretty exposed as nothing more than an unimportant object for Kross to toss around. I wish they would’ve done more to make Kross more interesting before they decided to make him the top rudo or their version of Brock Lesnar on their roster, but there we are. The atomicos seemed to be a dare to see what would happen if they dropped Marty in the weirdest possible match. He did far more teaming with Elegido against the Clowns than you’d expect, but maybe it makes more sense if you knew it was just a setup for Marty to attack Elegido. This also felt pointless and not very good. Suicide & Bengala were very good against each other, even though Suicide should be about half blind with his bandanna pulled down to Gedo levels. The exoticos were OK, but this match is a waste of time.